← Is a Brick Home Better Than Siding? As well as hampering day to day life, clutter can be bad for your health, increasing levels of the stress hormone, cortisol. One solution to an untidy home is to embrace the latest home organization trends that involve brutal and regular decluttering of belongings. However, there are always going to be items that need to be kept, especially in a family with ever-evolving needs, lifestyles and hobbies. Whatever the size of your home, it’ll run much more smoothly if you can find space to store small treasures for safekeeping or keep larger items ready at hand but without cluttering up your home. If you have a backyard, then storage sheds can provide extra space for larger, important items that, although not needed every day, still need to be readily accessible. It can be tempting to cram any new overflow space with stuff from your house, but try to be organized and make good use of every inch. By suspending bicycles from the ceiling or hanging gardening tools on the walls you can free up floor space, making it easier to move around and find what you need. A recent study has revealed that Americans spend two and a half days every year looking for lost items. One of the most common and frustrating items to misplace is a set of house or car keys, and often they get ‘lost’ because we don’t have a regular place to store them. Simply fixing some small hooks in your hallway and practising the habit of hanging up your keys as soon as you come in the house could save you a lot of time, money and anxiety in the future. With a family, kitchen surfaces and dining tables can very quickly get covered in piles of school reports, invitations and unsolicited mail. A simple filing system in your hall means that you can deal with paperwork as soon as it comes through the door. Sort it into piles using an in tray, and immediately recycle anything you no longer need. This will avoid paperwork building up and ensure that you keep important receipts and bills safe, never miss out on a party, and stay up to date on your kids’ progress. Taking a few small steps to organizing your home, can make everyday life much easier and less stressful. 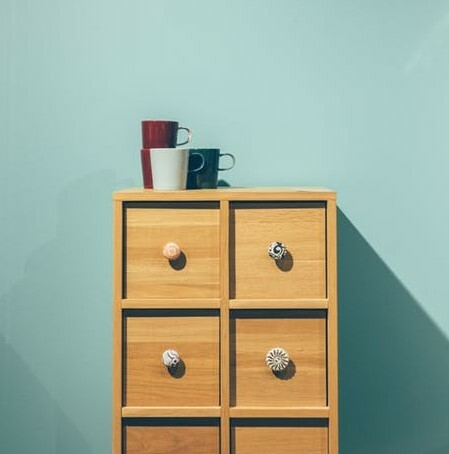 As you create good habits, set up new storage space and find a regular place for every important item, your home will soon be running smoothly, and the idea tidying up will be much less daunting.